A Logan County deputy appears to be okay after being involved in a two-vehicle accident Tuesday afternoon. The accident occurred on Highway 33 just west of I-35 shortly after 5:00 p.m. The driver of the white, four-door Chevrolet refused treatment. Meanwhile, the deputy, who was driving a four-door pickup truck, appeared to have a head wound at the scene. He was transported to Mercy Logan County Hospital with a non-emergency transport, where a CAT Scan proved to be negative, and had minor cuts and bruises along with a deep wrist bruise. “Yesterday (Tuesday) one of our Deputies was involved in an accident while attempting to catch a traffic violator,” Chief Deputy Rob Groseclose said in a statement to Guthrie News Page. “As our deputy approached the Love’s (convenient store) on state highway 33, a vehicle pulled out in front of him. The deputies patrol truck struck the other vehicle on the driver’s side,” Groseclose said. The Guthrie Police Department responded to the call inside the city limits, but the Oklahoma Highway Patrol worked the accident. 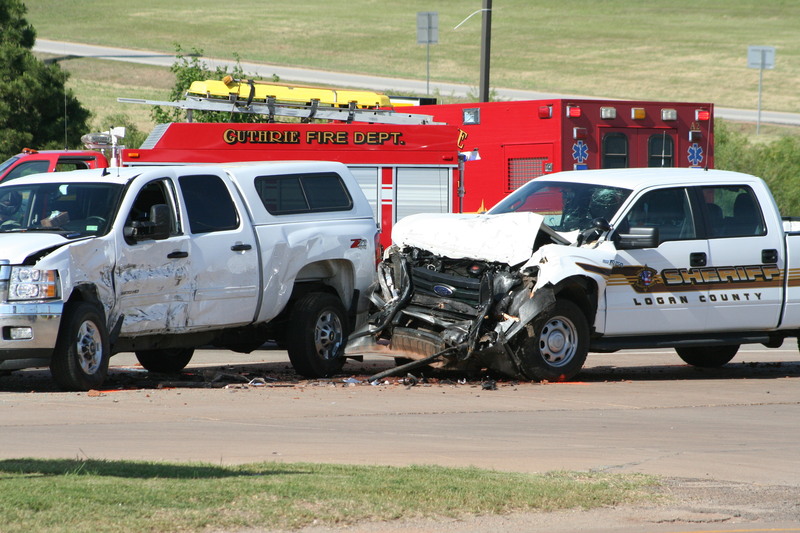 A copy of the accident report by OHP will not be available for approximately three weeks.